In Hear This, The A.V. Club writers sing the praises of songs they know well. This week: Songs by acts who have new albums coming in 2016. In the mid-’80s American music industry, as the rock and pop stars of the ’70s were beginning to fade, acts like R.E.M., U2, and even Madonna emerged from formerly marginalized musical subcultures. So why not The Cult? The band had as good a shot as any. Its sound was polished, its songs were resounding, and frontman Ian Astbury fashioned himself as an old-fashioned, scarf-festooned rock god, akin to Robert Plant, Freddie Mercury, Steven Tyler, and Jim Morrison—the latter of whom he’d eventually replace in a 21st-century touring version of The Doors. 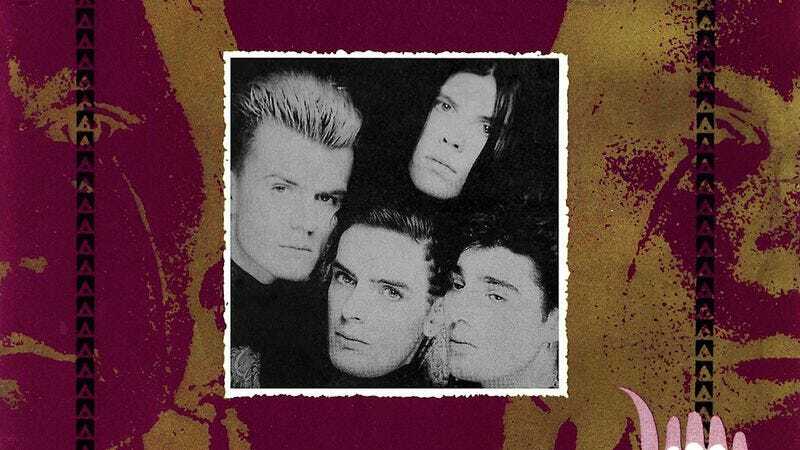 In December 1985, The Cult walked onto the Saturday Night Live stage and performed “She Sells Sanctuary,” a song the band had released as a single in advance of its second album Love back in May of that year. “She Sells Sanctuary” was already a hit in the U.K., and had been getting a lot of play on American college radio and some adventurous album rock stations. But The Cult wasn’t a big enough act yet in the U.S. for SNL to give the band more than one performance slot that night; The Dream Academy and “Life In A Northern Town” took the other musical shift. As it turned out, The Cult did have what it took to become stars in America. It just happened on the next album, 1987’s Electric, which saw the group working with producer Rick Rubin and stripping down to tight, loud AC/DC-style hard rock. (The album after that, 1989’s Sonic Temple, was an even bigger hit, working the same vein.) Love was huge around the world, but in the States, aside from a small set of fans, it faded into the mishmash of styles then being imported from the U.K.: goth, drone, post-punk, “big music,” and the like. “She Sells Sanctuary” was probably referring to the power of finding solitude in a woman’s arms and the matriarchal energy, whether it be an actual physical person or in a spiritual sense, the greatest matriarch, and thinking of the cosmos as a female energy rather than a male energy. These are archetypal things I was picking up from discovering things like Joseph Campbell and Buffy Sainte-Marie or even Jim Morrison. What Astbury doesn’t talk much about is how the song sounds. The Doors are in there—Astbury’s voice assures that—but as with a lot of mid-’80s alternative rock, the beat is steady and walloping enough that “She Sells Sanctuary” could be played in dance clubs. Billy Duffy’s guitars alternate between grinding metallic riffs, Johnny Marr-like shimmer, and the kind of propulsive acoustic rhythms that peers like The Cure and Echo & The Bunnymen were also experimenting with. The Cult crammed it all into a recording that goes through simple changes throughout, from the soft build-up of the intro to the drama of its instrumental break. This was the band’s big swing: its crack at making a “River Deep, Mountain High,” or “Good Vibrations.” In its wake, the band narrowed. But for one moment, “She Sells Sanctuary” explored all The Cult could be.